Urgency ushers itself upon us when the choking embers of camplight give way to the disorienting, dilating dusk within the woodlands. 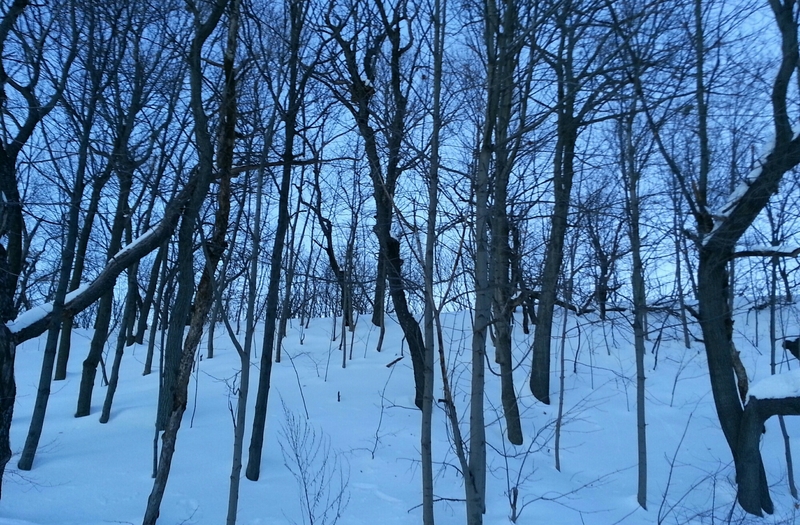 Faint echoes amidst this forested twilight imminently become the crunchy, gelid compression of nearby footsteps that taint the sterility of fresh fallen snow. Where did you find the word ‘gelid’? I had to look it up, but I am now going to use it in the future. Great post (as usual)! Thank You so very much Dennis. I appreciate it. I honestly appreciate that. Thank You. Thank You so much Nelly. Great picture and great post. I loved it, beautifully descriptive. You are very kind… Thank You so much. What a fantastic way to purchase that thought from my brain. I love the pristine crispness that lay untouched by any disturbance. When it gets footprints or animal prints or even ice droppings that break the surface, it does, in my eyes taint that. I really like that your eyes see that too. Wow. Many, many smiles. I so appreciate your thoughtful commentary. Thank You so very much for taking the time to share your feelings. Beautiful work big guy !!! You are very kind Anjali. Thank You so much for your thoughtfulness. very philosophic, and beautiful — makes me cold. Thank You for your wonderful words Joanne. I appreciate it. I like your BLOG and approach very much. The simplicity; the brevity of words — very concise — very nice! A lovely scene. May I reblog? I really appreciate it. Thank You so much.